Many computer users don’t like to turn their computers off and prefer to have them immediately available to use the next day. Even though desktop and laptop computers are more power efficient these days, it still doesn’t make sense to leave your machine on 24/7 consuming energy when it’s not required. The argument about switching your PC on and off causing long term damage to components and hard drives has been pretty irrelevant for several years because today’s hardware is far more resistant to those type of problems. If you hate to wait for Windows to boot up, you can always put your computer into Standby to make it immediately available from its low power state. Or use the slightly slower Hibernation because either mode will help you save almost as much energy as you do turning off your computer for the night, and you won’t have to endure the lengthy reboot process the next day. But what about if you like your computer to wake up and check your emails before you get to it, or download files only at a certain time of day or night, or simply be an alarm to wake you or alert you at a specific time? This isn’t a problem as it’s possible to wake up your system from Standby mode or Hibernation at a specified time or date with the aid of a utility, here’s 5 tools to help you to achieve it. WakeOnStandBy can perform a number of tasks after it automatically wakes your computer up from hibernate or standby at a predefined time. What makes WakeOnStandBy quite useful is the option to easily set the program to wake up and perform a task such as run a program, open a webpage or play an audio/video file etc. Then you can choose to shutdown/sleep/hibernate the computer again after a specific time while running another program if you wish. Although the interface might look a little confusing, it is actually quite easy to configure and is set out in a series of numbered steps. WakeOnStandBy can also be used to run scheduled operations every day at set times or on specific day(s), just set the time to wake up and click Start. In some cases you may need to tick the box to repair your local network and/or internet connection upon waking up from suspended state. In the options menu you can save the schedule as a batch file and also view the extensive command line support options. When you’re ready there are sleep and hibernate options available from the tray context menu. WakeOnStandBy is portable and works on Windows 2000 up to Windows 8. The basic free version of TimeComX might be missing some of features of the Professional version such as remote process control or running parallel tasks, but it’s still a highly accomplished piece of software that can shutdown and wake up your computer in a multitude of different ways. It’s can also be made into a portable application by copying the folder from \Program Files\Bitdreamers if you install it first or extract the installer with 7-Zip. Setting up a shutdown and wake up task is done as a series of steps and you have to configure a shutdown event for wake up to work, even if it’s just a few seconds. This can be done using a simple dial or advanced timer, a specific time, day and date, and also more advanced CPU/memory/disk/network monitor. 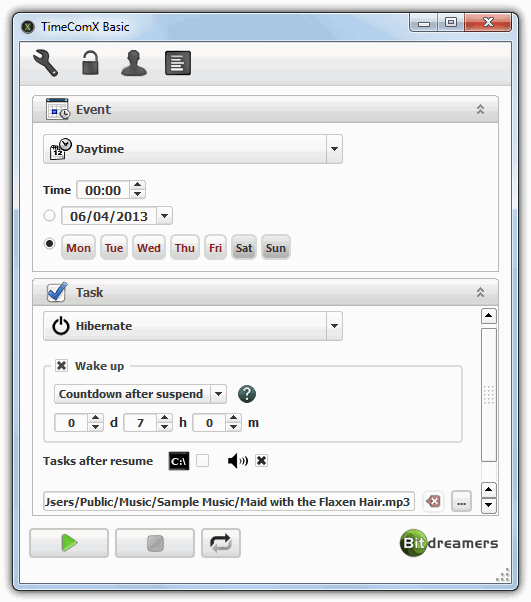 In the Task section choose either Sleep or Hibernate to enable the Wake up options of a countdown timer or date and time to wake the computer. Then you can choose to run a program with arguments/URL and play an audio file with optional auto repeat. TimeComX Basic has separate 32-bit and 64-bit version and works on Windows XP or above. KM Wakeup is more of a dedicated tool to wake up the computer from standby or hibernate and doesn’t concentrate so much on tons of different shutdown methods, although the basics of a timed suspend, hibernate and shutdown can be setup if you wish. The program also allows you to setup alarm lists which can be loaded, created and saved to be used on other computers or for different situations. Creating a new alarm is easy, press the New button (the middle one) and in the window you can set a frequency of Once, Daily, Work days (Mon-Fri), Weekend, Weekly, Monthly or Yearly. Set the required time to wake up and date if needed, and then you can create an optional action of which there are three to choose from by ticking the boxes; an information message, play a sound and run a program. Then simply press the Suspend button in the main window, it can be configured in the Settings to activate standby or hibernate on press. 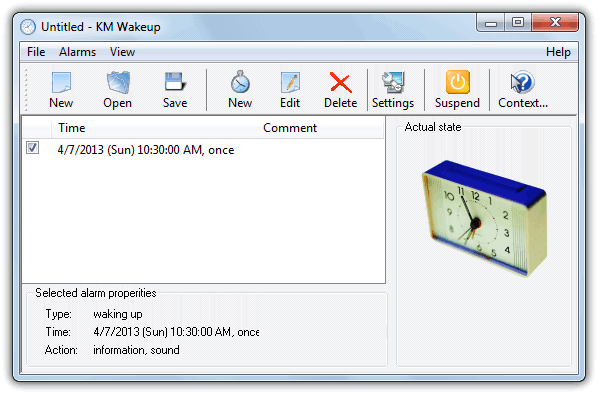 KM Wakeup works on Windows 98 and above as long as the hardware is ACPI/APM compliant. this is a great program, as anyone figure out how to get the computer to wake up every 15 to 30 minutes using WOSB? This post has been online for almost 8 years and it seems you’ve updated it 2 years ago! Some links are dead but I managed to download WakeOnStandBy and it worked like charm! You are a legend. Hats off to you! Thanks for the report, some of the download links have been updated. Thanks a bunch for this utility. I use my laptop as an alarm clock and this helps save a bunch on my utility bill =) Awesome program and well written instructions for use! You (who created such a smart programs) are real men. Wow, pretty cool application. What are you guys saying about automatically connecting to the internet? This utility did that to me. Make sure to check repair network box. This utility do the best job for saving our time and PCs. This is also great for scheduling a task while in Safe Mode, when the Windows Task Scheduler is disabled. Wow. I didn’t think there would be a program that could do this. Brilliant!